In the midst of summer’s heat, the picture of a handsome mountain lodge set beside a cold mountain stream is pretty inviting. Gaze at the image of Laramie River Dude Ranch, shown at left. Now picture yourself there, or at any of several amazing dude and guest ranch resorts that focus on fly fishing. Don’t you feel cooler already? It’s not too late to make plans for a summer angling adventure at any of the eight ranches listed below. And if you don’t have a rod and reel, or can’t cast a line worth beans, don’t worry. All these ranches have you covered with gear, instructions, and whatever you need. And when you call, be sure and mention Ranchweb. Combine a trip to nearby Yosemite with a visit to the Hunewill Guest Ranch, one of California’s oldest working cattle ranches. Horseback riding, through 26,000 acres of cool, lush meadows and heavily timbered peaks, is the main attraction here. As is cattle work, family fun, and just sitting back on the porch watching the sun set. But trout fishing on the nearby Walker River is world class. And don’t overlook the many lakes and streams in the adjacent Toiyabe National Forest and throughout the Eastern Sierra escarpment. Details: New for this year: The Week of the Buckaroo Moon: August 21-28, 2010 (and August 21-26 (5- Day Package). Take a moonlight ride and barbeque under a full Buckaroo Moon, enjoy campfire and singing by the pond, do a walking historical tour of the ranch, team penning and trailer loading on horseback and take a rare chance to horseback ride and tour the ghost town of Bodie. The week winds up with a special cattle gather in the Sweetwater Mountains. Coulter Lake Guest Ranch Inc. The Rocky Mountains is your playground when you base at this dude ranch resort near Rifle, Colorado. Take a scenic horseback ride on miles of trails throughout the White River National Forest, or hike up a canyon trail or trek to Rifle Falls in Rifle Mountain Park. Whitewater rafting through beautiful Glenwood Canyon on the Colorado River is another incredible experience nearby. Details: the guest ranch has its own beautiful, spring-fed lake, well-stocked with rainbow trout. There are small boats ready for you to use, or you can cast right from the banks. The ranch can provide basic fishing equipment (ideal for kids and beginners), or you can bring your own gear. Nearby Rifle Creek (license required) is the hotspot for stream fishing for rainbow and brook trout. Ask about their Fly Fishing Skills and River package (20% discount) including a seminar by a master fly fishing casting instructor and a float or wade trip on the Colorado or Roaring Fork rivers. Burleigh notes that lake fishing enthusiasts enjoy Hohnholz Lakes but may want to bring along more of their equipment. Boats are easily accommodated if the angler would like to bring their own. “More often, we’ll see anglers bring their favorite belly boat for some lake floating. Guests who fly in and don’t have a rental car are welcome to arrange travel to and from the lakes with your guest coordinator Kathy.” Details: Want to learn the ins and outs of rods, reels, and flies? 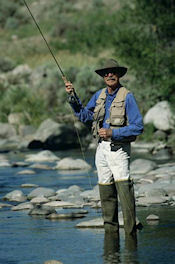 Once a week, the ranch’s pro guides offer free fly fishing instruction. Casting techniques are taught out on the front lawn and then everyone heads for the river to practice. And the ranch has equipment that guests can borrow free of charge. July Special: Take 30% off any three, four, or seven night stay starting during the week of July 18th-25th, 2010. You can ride the Rockies and then take in Cheyenne Frontier Days (which start Friday 7/23). And just for Ranchweb blog readers: They normally offer anglers who choose not to ride horses a 10% “Non Riding” discount. Anyone who mentions this blog post could qualify for a 20% “Non Riding” discount for any member of their party who comes to fish and does not partake of the riding program (riding members of the angler’s party would pay normal rates). Commune with nature beside the clear mountain streams of the Colorado Rockies. If fly fishing is your passion, you’ll love North Fork Ranch’s pristine stretch of water— over two miles—and all located just one hour southwest of Denver. Their professional guides will make sure you have an angling experience to remember. A stone’s throw from their back porch, you find the tranquil North Fork of the South Platte River teeming with Brown, Cutthroat Rainbow, and Steelhead trout. Details: Fishing is year round, guided only; choose a full or half day trip. Details: Guys, make it more than just a fishing trip: bring your gal for a Bed and Breakfast Fishing Package. Fish all day, then enjoy the two of you can a romantic evening, with a hayride, singing by the campfire, or square dancing. Set in the lush Frank Church Wilderness and enveloped by the Salmon River mountains, the Diamond D guest ranch has a long menu of activities. In summer, take your pick from hiking, gold panning, swimming, horseback riding, and, of course, fly-fishing. You could title your summer adventure “A Creek Runs Through It”, because Loon Creek runs right through the ranch. That means fly fishing is huge here. Throw out a line for cutthroats, rainbows, and other native trout in streams just yards from your cabin. Or try your luck in the ranch’s own lake (rowboats available). 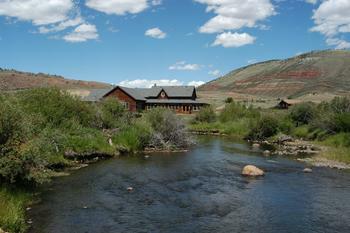 Details: The guest ranch provides: rods, reels, all flies, lines, leaders, tippet, nets, and professional instruction. Fishing Licenses may be purchased through the ranch. Long, sunny days, and angling on southwest Montana’s blue ribbon rivers and trout streams. What could be better? Lone Mountain is one of Montana’s premier dude ranches, with comfy cabins, gourmet food, and a gorgeous mountain setting. And for anglers, it’s ideally located. The ranch sits outside Big Sky, just a few miles from the Gallatin River and handy to the Madison or Yellowstone rivers; best of all, you can fish with their Orvis-Endorsed Fishing Guides. Details: Get an early start on the fishing season with their Fly Fishing Specials – 15% Discount (approx); join Lone Mountain Ranch for 6 nights/5 days of fly fishing or 4 nights/3 days of fly fishing on southwest Montana’s blue ribbon trout streams (other combinations available). The 6 night/5 days of fly fishing package costs $2850/person (based on double occupancy in a small cabin) and includes 6 nights lodging, 5 days guided fishing, 3 meals daily, fishing license, flies, and shuttle to and from the airport in Bozeman, Mt. The 4 night/3 days of fly fishing package costs $1850 per person ( based on double occupancy in a small cabin) and includes 4 nights lodging, 3 days guided fishing, 3 meals daily, fishing license, flies and shuttle to and from the airport in Bozeman, MT. A luxury resort high in the Bitterroot Mountain Range of the Montana Rockies, the Triple Creek Ranch is a member of the prestigious Relais & Châteaux. And along with the world-class accommodations and food, you’ll find top-notch angling nearby. Let the experts at Triple Creek help plan an off-ranch special adventure of guided fly fishing or scenic river floating. At the ranch, you can learn the fundamentals of fly fishing and casting a fly rod. Beginner, intermediate, or expert anglers can also float with an experienced guide down the beautiful Bitterroot River, West Fork or East Fork of the Bitterroot River, for a memorable day of trout fishing. Details: It’s an Orvis-Endorsed fly fishing lodge and they’ll set you up with local guide services; complimentary Orvis fishing gear is available from Triple Creek Ranch and your guide will furnish the rods, reels, flies and his or her expertise. Ask about the Selway/Bitterroot Fly-Fishing Package (a 10% discount on a five-night package, a 5% discount on a three-night package); guests fly from nearby Hamilton to the banks of the Selway River, where a guide awaits with horses to ride to the best fishing spots along this catch-and-release river, famous for its cutthroat, rainbow, bull and steelhead trout. At this Jackson Hole-area dude and guest ranch, they find that hiking and fly fishing is just as popular as horseback riding. And why not? This Wyoming dude ranch owns a 1.5-mile stretch of upper Flat Creek’s challenging waters and the 45-acre Flat Creek Lake. And anglers have access to another 5 miles of fast riffles and deep pools on public land just west of the ranch. Their rule is: fly fishing only, catch-and-release. Their favorite spot is the “Curt Gowdy hole,” a deep bend in Flat Creek where wily cutthroats and brook trout congregate. For dry fly purists, Flat Creek is blessed with prolific hatches of caddis flies, mayflies, and a host of others. Details: The ranch can lend you fly rods, reels, nets and waders; they also provide a free fly-fishing clinic for those who want to learn or brush up on fishing techniques. Ah, summer at the ranch. Horseback riding, hiking, fly fishing, oh my! But how you pack may determine whether you’re prepared for all the kinds of fun stuff you can enjoy on the ranch. A little planning goes a long way. Going to the mountains? Prepare for every kind of weather, from summer sun to sudden showers and mountain breezes. Out on the plains, its bright sun and hot weather most of the summer. And at a California coastal ranch, you’ll have to dress for the occasional fog bank that drifts in fro the ocean (yep, even in summer). So check with the ranch, and check the forecast before you go. But relax: ranch dressing always means comfy and casual. Jeans: Well, duh. 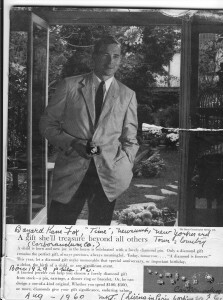 But here’s a tip from Gene Kilgore himself: before the trip, wash all the jeans with fabric softener so you can avoid saddle sores from the rubbing of that heavy, stiff denim inseam (ouch!). Most ranches have washing machine/dryers available but if you don’t want to spend vacation time doing laundry, bring extra jeans (at least 3 pairs) , socks and tee-shirts for all. Cowboy hat: You want to fit in, like the cute pair at left, don’t you? Splurge on a good triple X felt hat. Boots: You gotta have riding boots for horseback riding. Ranchers advise against riding in sneakers or hiking boots—your foot could slip through the stirrup or get stuck in it. But if you don’t have any, check ahead: some ranches have spare pairs of kids and adults’ boots for you to borrow while at the ranch. Riding helmets: It’s not the wild, wild, West anymore, and most ranches recommend wearing a helmet while riding, especially for kids. 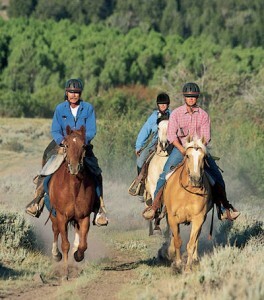 Most ranches have a supply of helmets available if you don’t own a riding helmet.